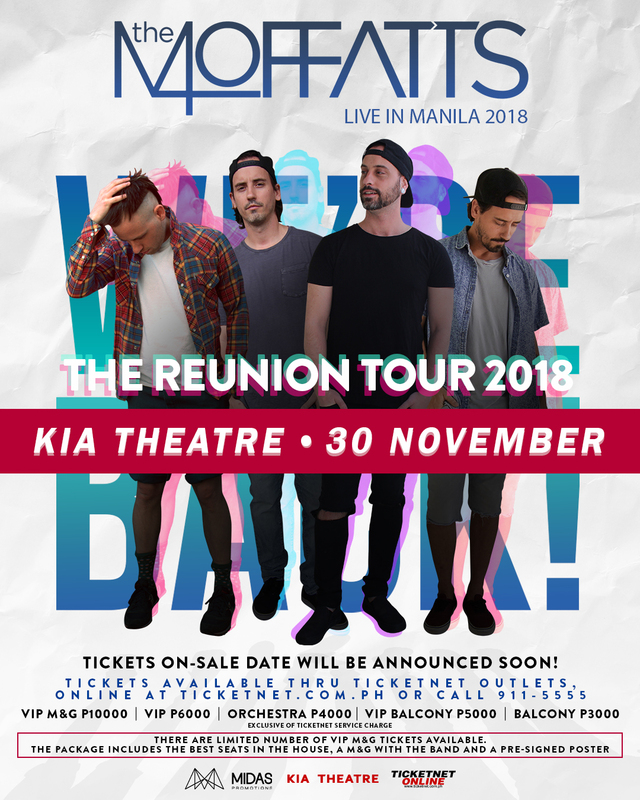 Midas Promotions is happy to announce that The Moffatts will return to Manila for their REUNIONTOUR on the 30th of November, 2018. They will be performing an intimate live set at the KiaTheatre, that will be renamed the New Frontier Theatre after October 1st. For the first time in almost twenty years the boys are back together and ready to deliver all of theirbiggest hits in a way you’ve never heard them before! Prepare to hear your favourites like ‘MissYou Like Crazy’ and ‘If Life Is So Short’ in a sonically revamped, mature style that the boys havedeveloped over the years as professional musicians working on their own projects. Tickets will go on sale Saturday, September 30th at 10AM via all TicketNet outlets, ticketnet.com.ph, or call 911-5555. This will be an all seated show. Ticket prices are listed below and are excluding ticket processing fees: VIP M&G P10,000; VIP Seated; P6,000 Orchestra; P4,000 VIP Balcony P5,000; Balcony P3,000. The VIP M&G tickets are an exclusive limited offer that include the best seats in the house,a M&G photo opportunity with The Moffatts and a pre-signed tour poster.